The Networking service, code-named neutron, provides an API that lets you define network connectivity and addressing in the cloud. The Networking service enables operators to leverage different networking technologies to power their cloud networking. The Networking service also provides an API to configure and manage a variety of network services ranging from L3 forwarding and Network Address Translation (NAT) to load balancing, perimeter firewalls, and virtual private networks. 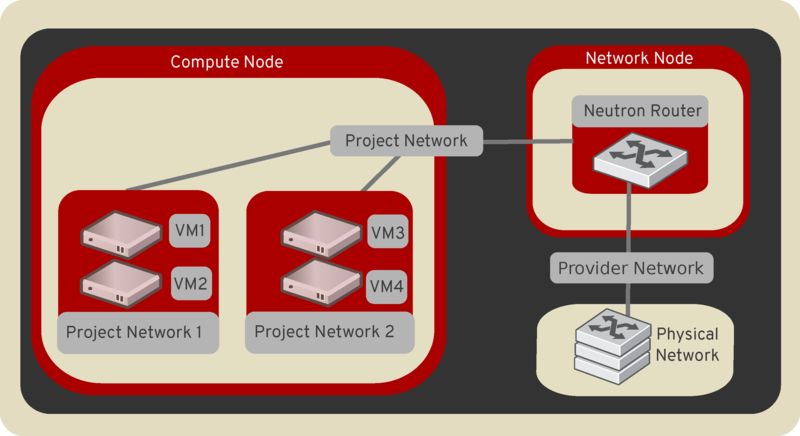 To configure rich network topologies, you can create and configure networks and subnets and instruct other OpenStack services like Compute to attach virtual devices to ports on these networks. OpenStack Compute is a prominent consumer of OpenStack Networking to provide connectivity for its instances. In particular, OpenStack Networking supports each project having multiple private networks and enables projects to choose their own IP addressing scheme, even if those IP addresses overlap with those that other projects use. There are two types of network, project and provider networks. It is possible to share any of these types of networks among projects as part of the network creation process. The creation and modification of provider networks enables use of physical network resources, such as VLAN-s. Enable these changes only for trusted projects. Also, provider networks only handle layer-2 connectivity for instances, thus lacking support for features such as routers and floating IP addresses. Routed provider networks offer layer-3 connectivity to instances. These networks map to existing layer-3 networks in the data center. More specifically, the network maps to multiple layer-2 segments, each of which is essentially a provider network. Each has a router gateway attached to it which routes traffic between them and externally. The Networking service does not provide the routing. Routed provider networks offer performance at scale that is difficult to achieve with a plain provider network at the expense of guaranteed layer-2 connectivity. See Routed provider networks for more information. Users create project networks for connectivity within projects. By default, they are fully isolated and are not shared with other projects. OpenStack Networking supports the following types of network isolation and overlay technologies. VXLAN and GRE are encapsulation protocols that create overlay networks to activate and control communication between compute instances. A Networking router is required to allow traffic to flow outside of the GRE or VXLAN project network. A router is also required to connect directly-connected project networks with external networks, including the Internet. The router provides the ability to connect to instances directly from an external network using floating IP addresses. A block of IP addresses and associated configuration state. This is also known as the native IPAM (IP Address Management) provided by the networking service for both project and provider networks. Subnets are used to allocate IP addresses when new ports are created on a network. End users normally can create subnets with any valid IP addresses without other restrictions. However, in some cases, it is nice for the admin or the project to pre-define a pool of addresses from which to create subnets with automatic allocation.